"The only true paradise is paradise lost"
Born on march 23, 1983 in the city of Tomsk, Russia. In 2000 entered Tomsk STATE University (Computer Science Department). Due health reasons, studying was interrupted until 2002. After graduating the university in 2012, education was continued for post-graduate studying with acquiring a Ph.D. in 2010. 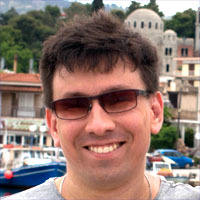 The thesis is dedicated to the balanced class of Vehicle Routing Problem and made with the supervision of professor Yuriy Leonidovich Kostuk. From 2006 to 2011 worked in TS Factory. From 2011 to 2014 in ALT Linux. Participate in ALT Linux Team from 2013. Blind since 2002 due to health problems.